Sometimes the most random of coincidences are as rewarding as they are surprising. Covering the Ischia Global Film & Music Festival for the site, I was principally on hand to interview the director and star of Cairo Time (both of which you can watch here). With more than enough hours to kill between interviews, I just happened to read an article in last month's Sight & Sound on the Blu-Ray release of Tran Anh Hung's new film, I Come with the Rain, a day before the film's star Josh Hartnett, arrived on the Italian island, not to plug any new films (he revealed in the press conference that he's currently between jobs), but simply to lend the festival some star wattage and have a bit of a knees up in the process. The oeuvre of Mr Hartnett is not something you'd have an easy time connecting to our "beyond the mainstream" coverage here at DVD Outsider, but then I'd say, you're just not looking hard enough. 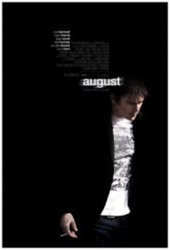 The eye candy of Sofia Coppola's The Virgin Suicides and the then breakout, pin-up of teen fodder like Halloween: H20, The Faculty and Wicker Park (a misjudged remake of L'Apartment), Josh Hartnett has been trying, in the years since Pearl Harbour, to challenge himself and his fans, by working with top flight directors like Brian DePalma and Rod Lurie, crafting infinitely more complex and conflicted characters whose agenda and actions are not always so readily understandable or all that empathetic. Sadly, cinemagoers are still more aware of Hartnett's string of off-screen romances than they are of the many ways in which he pushes himself in the aforementioned films. All three were beset with problematic distribution (or lack thereof) and didn't so much fly under the radar as make no blip on it whatsoever. 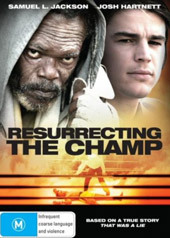 While August and Resurrecting the Champ are both available on region 1 DVD – I strongly encourage you to pick up both -- I must express stern reservations in my recommendation of the latter of the trio, I Come with the Rain, which was recently released exclusively on Blu-Ray in Japan and on Region 3 DVD in South Korea. * This marks festival circuit fave, Tran Anh Hung's return to cinema after a nine absence, during which he spent three years to get the film off the ground and almost as long to secure the film any kind of release. The Vietnamese, France-based director behind, The Scent of Green Papaya, Cyclo and The Vertical Ray of the Sun has progressively confused, confounded, and polarized audiences over the course of four features that flip-flop between the darkness and the light. His latest is unquestionably a case of the former and certain to prove his most divisive yet. The tagline asks us if we can find the path to redemption. The more pertinent question pertains to the feasibility of the viewer cutting their own path through a barrage of sound and fury, obfuscating a narrative that is mostly not existent in the first place. Good luck grappling with themes that on the most rudimentary level, don't ever add up the way they should. If not for portentous crane shots of people being nailed to crosses, it'd be hard for any of the vague waffle about messianic suffering to sink in or resonate when the fumbling of the basic plot is so lacking in coherence. What does make sense is that Josh Hartnett plays private eye, Kline, an ex-cop kicked off the force or self exiled (I was never sure which) after taking his work home with him and getting involved with, feeling empathy for, and starting to adopt the mindset of the vicious serial killer he'd been tracking. Hasford's (Elias Koteas) particular depravity is the dissection of his victims' limbs while they're still alive, then reassembling them into tormented sculptures of the H.R. Gieger variety, that preserve their pain and suffering. Make no mistake about it folks, this is the stuff of nightmares. It's bad enough I had a hard time getting to sleep that night, but unfortunately, certain imagery from Hansford's "gallery" still stays with me even now. Kline responds by shooting and killing Hansford but continues to be haunted by him via-flashback as he accepts his newest assignment in Hong Kong via a Charlie's Angels style intercom. His mission is to track down the missing son of a pharmaceutical magnate, who has re-surfaced in the Philippines as some kind of Christ-like healer. Calling upon the services of Meng Zi, an inside connection in the Hong Kong police force, Kline sets off on a journey, like Colonel Willard before him, that takes him down river into his psyche's deepest, darkest recesses – though Hartnett comes off less like Martin Sheen and more like his Hollywood Homicide co-star, Harrison Ford had they expanded his role in Coppola's film; gruff and by the book, 'cause it's the only way he knows how. Yet, I'd be lying if I said that the disjointed, undeniable lyricism in the telling of a tale that is highly sensory, and non linear, didn't have a riveting, car-crash fascination about it. Individual scenes pile up, each more maddeningly incomprehensible and disconnected than the last, but making any kind sense out of this impressively transportive, reflective dreaminess as it jettisons all rhyme, reason and compulsion to justify itself, endears as a sadomasochistic pleasure, very much in keeping with the story of a man's mind plunging further down the rabbit hole. 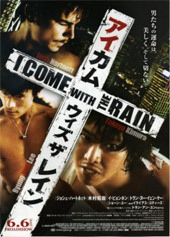 An exceedingly busy film despite its methodical pace, I Come with the Rain was in the eye of a post-production storm as Hung fought his producers for final cut. Like Kline, the final product is victimised, flung like a tornado's debris across the counties of three genres: ultra-violent triad movie, ultra-violent serial killer film, and a sleazy, sinful heart of darkness narrative in the vein of Paul Schrader, all rolled up and telescoped through glass shard multiple flashbacks. My thanks to Josh's publicist, Susan Patricola for setting up the interview.